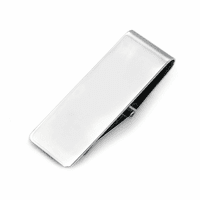 This unique money clip is the ultimate in timeless elegance. 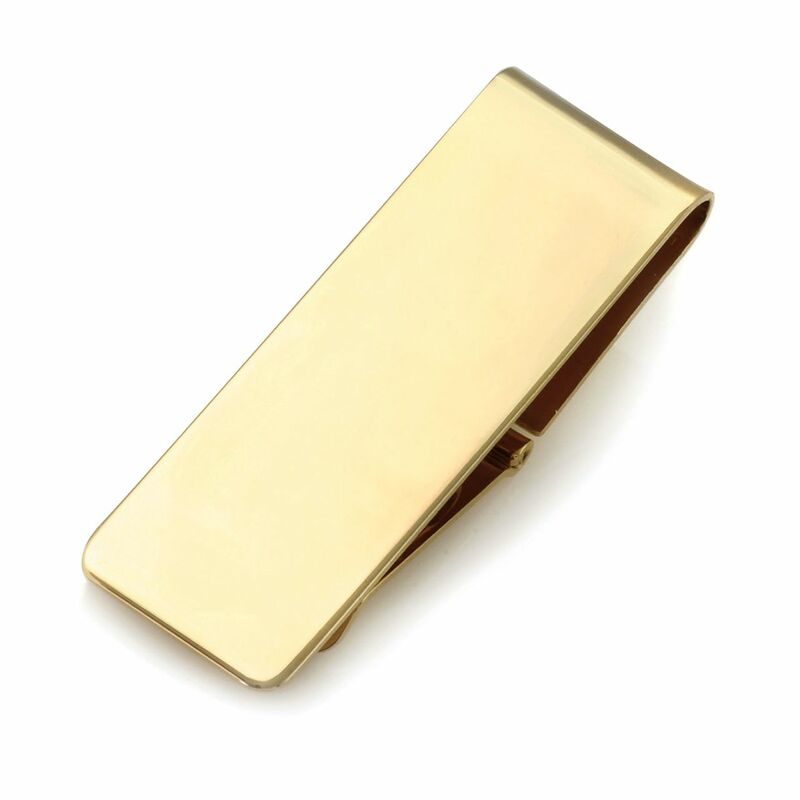 It's sleek and simple in design, crafted in solid 14 karat gold, with a smooth face that is perfect for personalized engraving. It has a hinged mechanism that allows it to open fully for adding and removing bills, and closes securely to grip up to 20 folded bills. This is a gift that will last a lifetime, and be a treasured family heirloom to pass on for generations to come. 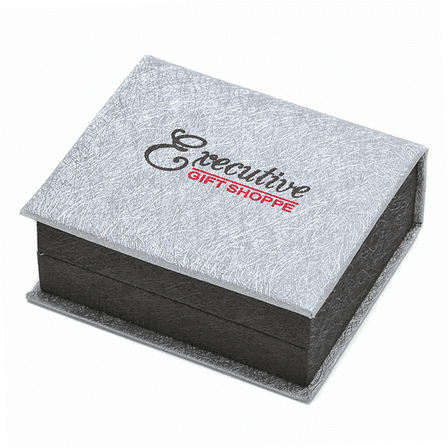 It's perfect for a 50th Golden Anniversary, as a gift for your groom, and for other very special occasions. 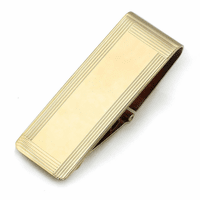 Dimensions: 2 1/4" x7/8" x 3/4"
How many grams of gold does clip have in it? It is approximately 11.45 dwt (pennyweight) or 17.81 grams. 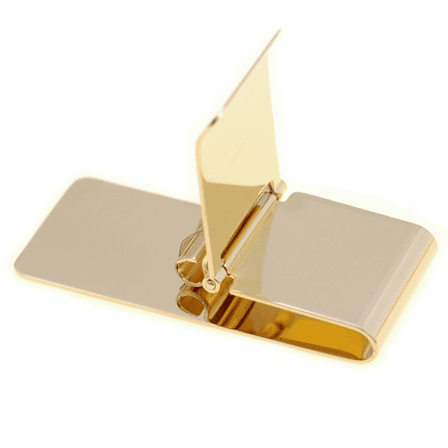 What is the weight of gold in this money clip? How many letters of engraving are included? What is the actual delivery time? Thank you. 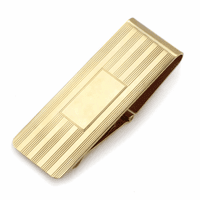 The approximate weight of the Classic Solid 14 Karat Gold Hinged Money Clip is 11.71 dwt and it can be engraved with 2 lines of engraving of up to 15 characrters per line. It would ship out about 1 week after it is ordered. I'm very pleased with my purchase. Some of my buddies are hating. (smile ) I was surprised and pleased with the call from customer service informing me that my choice of the most expensive shipping method would not get my package any quicker than any other because of where it was being shipped from. In essence, offering me the chance to downgrade my chosen method of shipping. I thanked them but expressed that I felt it would be safer. They assured me that it was insured by them but I still refused. But, ya gotta give them points for being proactive and honest. Jc.